This second midweek qualifier event of the 2018 Mega Match This campaign marks the halfway stage with twelve anglers now having confirmed a place in September’s big money final. Conditions for the day were much improved of late with plenty of cloud cover and a gentle breeze putting a much needed ripple on most areas of the lakes. The ninety five (95) competing anglers were generously pegged across Horseshoe, Beastie, Willow, Six Islands, Cedar and Oak lakes meaning a significant number of pegs had the potential to produce a match winning weight. However, that said, both Hoseshoe and Oak lakes were favourite to produce the eventual winner. Despite pleasant conditions on the day, there had been a sharp drop in temperature overnight to complicate what would have otherwise been a much more consistent match. Jimmy Brooks confirms his place in the 2018 Maver Mega Match This Final after topping a talented field at Decoy Lakes. The twelth angler confirming his place in this year’s Maver Mega Match This Grand Final was Jimmy Brooks (Angler’s Corner). Jimmy drew peg 9 on Beastie and started his match feeding casters shallow at 14 metres to catch a few fish early on. 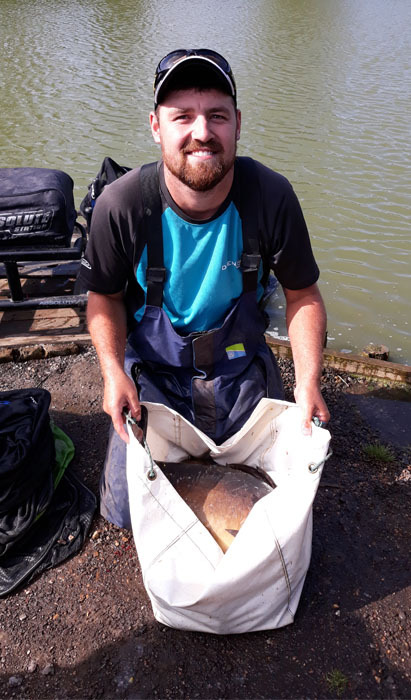 Whilst fishing this line Jimmy also fed casters at 12 metres down his edge, which he then switched to later on in the match to catch F1’s to 3 lbs up in the water with odd carp and skimmers inbetween. Jimmy alternated between his long edge line and various other ‘dobbing lines’ for the duration of the match to find carp to 16lbs mixed with F1’s and skimmers to finish the day with a total of 252-12-00. Jimmy also qualified for the 2018 British Pole Championship final in the process. Second place was taken by Maver / Dynamite Baits-backed Simon Skelton. Simon drew end peg 8, also on Beastie located in the opposite corner to Jimmy. Simon enjoyed a fantastic start to the match admitting to around 50lb of carp to 10lb within the first hour opting to fish pellet shallow over to farside cover at 14 and 16m. Simon continued to catch well throughout the day before his swim stopped producing with ninety (90) minutes of the match still remaining. Simon battled on through taking small fish for the remainder of the day to end proceedings with 199-13-00. Simon’s second place finish earns him a place in this year’s British Pole Championship final. Third place on the day went to fellow Maver / Marukyu man, Sam Brown. Sam drew peg 18 on Six Islands and secured an overall lake win with 154-01-00. Sam started his match fishing hard pellet on the pole before switching to corn down his edge later on in the match to find carp in numbers to enjoy a late flurry of fish. Sam also qualifies for the Maver British Pole Championship final on Sunday 19th August.